The Poor Fellow-Soldiers of Christ and of the Temple of Solomon (Latin: Pauperes commilitones Christi Templique Solomonici), popularly known as the Knights Templar, was one of the most famous of the Christian military orders. It existed for about two centuries in the Middle Ages, created in the aftermath of the First Crusade of 1096, to ensure the safety of the large numbers of European pilgrims who flowed toward Jerusalem after its conquest. The Templars were an unusual order in that they were both monks and soldiers, making them, in effect, some of the earliest "warrior monks" in the Western world. Members of the Order played a key part in many battles of the Crusades, and the Order's infrastructure innovated many financial techniques that could be considered the foundation of modern banking. The Order grew in membership and power throughout Europe, King Philip IV of France (Philip the Fair) moved against the Templars in an effort to seize its wealth, causing members in France to be tortured into confessions and burned at the stake. Under influence from King Philip, Pope Clement V forcibly disbanded the order on Friday October 13, 1307. Many legends surround the Templars, who continue to feature in various theories especially linked with the claim that they protected members of a lineage (the Sangreal) that traces itself back to Jesus of Nazareth. Not least of all because of their own rule of secrecy, much "supposition under the guise of history" has been written about the Templars. Despite the difficulty of separating fact from fiction, aspects of their relations with their Islam neighbors suggests that the period of the Crusades was not only characterized by hatred and enmity. Fletcher (2003) points out that there is no "Islamic historiography of the Crusades" since even though they are currently perceived as having permanently damaged Christian-Muslim relations, at the time Muslims saw them as border skirmishes that only inflicted pinpricks on the fringe of the Muslim world, thus the Templars also dealt diplomatically with their opponents. The High Templars were organized as a monastic order, following a rule created for them by their patron, Saint Bernard of Clairvaux, a member of the Cistercian Order. Each country had a Master of the Order for the Templars in that region, and all of them were subject to the Grand Master, appointed for life, who oversaw both the Order's military efforts in the East, and their financial holdings in the West. With the high demand for knights, there were also knights who signed up to the Order for a set period of time before returning to secular life, as well as the Fratres conjugati, who were married brothers. Both of these wore a black or brown mantle with a red cross to delineate them from the celibate lifetime members, and were not considered to be of the same status as the celibate brothers. It also appears that the serving brothers (frères casaliers and frères de métiers) were not separate from the sergeants, but rather that a sergeant who was a skilled tradesman or was unable to fight due to age or infirmity would perform these other functions. The majority of the Templars, including the knights and the Grand Masters, were both uneducated and illiterate (as were most knights of the day), having come not from the upper nobility but from more obscure families. At any time, each knight had some ten people in support positions. Some brothers were devoted solely to banking (typically those with an education), as the Order was often trusted with the safekeeping of precious goods by participants in the Crusades; but the primary mission of the Knights Templar was warfare. The Templars used their wealth to construct numerous fortifications throughout the Holy Land and were probably one of the best trained and disciplined fighting units of their day. They were also famous and easily recognized, with a white surcoat with distinct red cross emblazoned above the heart or on the chest, as seen in many portrayals of crusading knights. Initiation into the Order was a profound commitment and involved a secret ceremony. Few details of the rituals were known at the time, fueling the suspicions of medieval inquisitors. But initiates, at least in the early days of the Order, had to be of noble birth, of legitimate heritage, and had to be willing to sign over all of their wealth and goods to the Order. Further, joining the Order required vows of poverty, chastity, piety, and obedience. For the warriors of the Order, there was a cardinal rule of never surrendering. This fearless, uncompromising nature of the Templars, along with excellent training and heavy armament, made them a feared and elite fighting force in medieval times. The order was founded around 1118, by French knights Hughes de Payens, a veteran of the First Crusade, and Geoffrey de St. Omer, for the protection of pilgrims on the road from Jaffa and Jerusalem. At first, the order had only nine knights as members and relied on gifts and cast-offs. As a result, they were originally known as the Poor Knights of Christ. King Baldwin II of Jerusalem gave them a headquarters on the Temple Mount, above what was believed to be the ruins of the Temple of Solomon. It was from this location that the Order took its name of Poor Knights of Christ and the Temple of Solomon. The Dome of the Rock, one of the structures at the Temple Mount. The Order grew rapidly because of support from key church leaders such as Bernard de Clairvaux, and was exempt from all authority except that of the Pope, including temporal authorities. They were also exempted from paying tithes and taxed and empowered to claim these from others. Because of this official sanction, the order received massive donations of money, land, and noble-born sons from families across Europe, who were encouraged to donate support as their way of assisting with the fight in the Holy Land. Templar Knights also fought alongside King Louis VII of France, King Richard I of England, and in battles in Spain and Portugal. Though the primary mission of the Order was a military one, only a small percentage of its members were actually at the front lines, while many others were involved in developing a financial infrastructure to support the warrior branch. The Order also innovated ways of generating letters of credit for pilgrims who were journeying to the Holy Land, which involved pilgrims depositing their valuables with the Order before setting off on the journey. This may have been the first form of checking put into use. From this mixture of donations and shrewd business dealing during the twelfth and thirteenth centuries, the Order acquired large tracts of land both in Europe and the Middle East, built churches and castles, bought farms and vineyards, was involved in manufacturing, import, and export, had its own fleet of ships, and for a time even owned the entire island of Cyprus. After Jerusalem was lost to Saladin in 1187, the Crusades gradually wound down and European support for the Order began to falter. In the early 1300s, King Philip IV of France (also known as "Philip the Fair") was in desperate need of money to continue his war with the English. He began by approaching the Templars' Grand Master, Jacques de Molay, asking him to respond to allegations of malpractice. De Molay rejected the allegations out of hand. On Friday, October 13, 1307 (a date possibly linked to the origin of the Friday the 13th legend), Philip had all French Templars simultaneously arrested, charged with numerous heresies, and tortured by French authorities nominally under the Inquisition until they allegedly confessed. This action released Philip from his obligation to repay huge loans from the Templars and justified his looting of Templar treasuries. In 1312, due to public opinion and scandal, and under pressure from King Philip (who had been responsible for maneuvering Pope Clement V into the Vatican), Clement officially disbanded the Order at the Council of Vienne. Even though all their lands were supposed to be turned over to the Hospitallers, Philip retained a great deal of the Templar assets in France. Some other European leaders followed suit in an effort to reduce the amount of Church-owned lands and property. In 1314, three Templar leaders, including Grand Master Jacques de Molay, Hugh de Perault, and Godfrey de Goneville were burned alive at the stake by French authorities after publicly renouncing any guilt. Remaining Templars around Europe, having been arrested and tried under the Papal investigation (with virtually none convicted), were either absorbed into other military orders such as the Order of Christ and the Knights Hospitaller or contemplative Benedictine or Augustinian orders; returned to the secular life with pension; and in some cases, possibly fled to other territories outside of Papal control, such as England and excommunicated Scotland. But questions still remain as to what happened to the few hundreds of Templars across Europe, or to the fleet of Templar ships which, according to various works of fiction (such as Holy Blood, Holy Grail), vanished from La Rochelle on October 13, 1307. Also, the extensive archive of the Templars, with detailed records of all of their business holdings and financial transactions, was never found, though it is unknown whether it was destroyed, or moved to another location, or ever existed in the first place. Fighting the Muslims was central to the Order's existence, since its purpose was to protect the Christian kingdom of Jerusalem. However, the Order knew that this was impossible by military means alone without also engaging in diplomacy, since the crusader states were sandwiched between rival Muslim sultanates. On at least two occasions, they entered treaties with Muslims: In 1172, they entered an alliance with the Assassins; in 1239, they allied themselves with Damascus against Egypt. Baigent, et al. depict the Templars as enjoying "sustained and sympathetic contact with Islamic and Jewish culture." They may even have attempted to reconcile Jews, Christians, and Muslims, they argue, linking this with their theory "if Jesus were acknowledged as a mortal prophet, as a priest-king and legitimate ruler of the line of David, he might well become acceptable to both Jews and Muslims." They also enjoyed the friendship and respect of Prince Usama of Shaizar, who "liked and respected the Templars," admired Frankish justice, but found their medicine primitive. Usama, says Fletcher, was a frequent visitor to the royal court in Jerusalem. In modern times, it is the Roman Catholic Church's position that the persecution was unjust; that there was nothing inherently wrong with the Order or its Rule; and that the Pope, at the time, was severely pressured into suppressing them by the magnitude of the public scandal and the dominating influence of King Philip IV. In 2002, a copy of the Chinon Parchment was discovered by Dr. Frale in the Vatican Secret Archives. The parchment gave direct documented evidence and a new perspective on the Knights Templar and overturned some of the centuries-old myths and misconceptions that have grown around the Order. Howarth (1982) locates the downfall of the Templars within the struggle between King Philip and the papacy; like the Pope, Philip claimed, as had his grandfather, Louis IX, that "God's law was paramount" and that this was "interpreted and executed by the king alone." Nor only did he dislike the Templar's independence from his own authority, but he coveted their wealth. He inherited a kingdom impoverished by war. Initially, he concocted a scheme that would have combined the Templars with the Hospitallers and its Master should "be a king, or the son of a king." The fact that Templar meetings were held in secret, and members were forbidden to speak about its rites and practices, too, helped to make "the order an object of suspicion and apprehension," given their "wealth, freedom, and power." Starting with founder Hughes de Payens in 1118, the Order's highest office was that of Grand Master, a position which was held for life, though considering the warrior nature of the Order, this could be a very short period of time. As Howarth points out, the title "Grand Master" was never actually used "during the lifetime of the order." He was "called the 'Master of the Temple in Jerusalem.'" The Grand Master oversaw all of the operations of the Order, including both the military operations in the Holy Land and eastern Europe, and the financial and business dealings in the Order's infrastructure of Western Europe. Grand Masters could also be active military commanders, though this was not always a wise choice, as seen by the fate of the defeated Grand Master Gérard de Ridefort, who ended up beheaded by Saladin in 1189, at the Siege of Acre. The last Grand Master was Jacques de Molay. Sainte-Vaubourg, 76/Seine-Maritime, Haute-Normandie, France. In 1173, King Henry II, gave the manor Sainte-Vaubourg at Val-de-la-Haye to the Knights Templar. Mont-de-Soissons, 02/Aisne, Picardie, France—The chapel, pigeonniere, and grange all date from the thirteenth century. 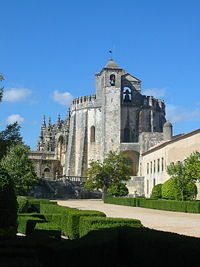 The chapel was restored by the Knights of St. John after the dissolution of the Templars. Acquebouille, 45/Loiret, France—This chapter-house was part of Commandery Saint-Marc d' Orleans. La Villedieu-Les-Maurepas, 78/Yvelines, Ile de France—Thirteenth century Gothic chapel with octagonal tower, and various buildings with a surrounding wall largely restored. Departmental cultural center. The Knights Templar have become surrounded by legends concerning secrets and mysteries handed down to the select from ancient times. Most of these legends are connected with the long occupation by the order of the Temple Mount in Jerusalem, and speculation about what relics the Templars may have found there, such as the Holy Grail or the Ark of the Covenant. And still more stories were started by fictional embellishments upon the Templar history, such as a treasure long hidden by the Templars. This idea has been used in two recent Hollywood movies, The Da Vinci Code and National Treasure. The film Indiana Jones and the Last Crusade depicted a rather more fantastic view of the history of the Templar. The idea has also been used in the graphic novel, Rex Mundi by Arvid Nelson, in novels by Steve Berry (The Templar Legacy), Raymond Khoury (The Last Templar), Jack Whyte (Knights of the Black and White), and even in a Donald Duck comic story by Don Rosa. Other legends have grown around the suspected associations of the Templars. Many organizations claim traditions from the original Order (the Freemasons, for instance, began incorporating Templar symbols and rituals in the 1700s) especially in relation to anonymous charity and good deeds. Some of these organizations which claim (spuriously) to be associated with the Templars are still active within communities across the globe supporting humanistic causes such as hospitals and medical treatment centers for the less fortunate. Additionally, while not claiming any direct descent from Templar Jacques de Molay, the Order of DeMolay, a youth fraternity associated with the Freemasons, cite de Molay's loyalty to his fellow Templars in the face of execution as a bedrock moral imperative. 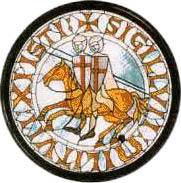 The dissolution of the Templar order is well documented, and some of its surviving members and properties after the destruction of the order in 1314, were absorbed into the Knights of the Hospital of Saint John, which continued as a minor military entity throughout the middle ages, and in 1318, the Military Order of Christ (Ordem dos Cavaleiros de Nosso Senhor Jesus Cristo) in Portugal as the heritage of the Knights Templar in Portugal, after their suppression of in 1312, under heavy influence from Philip IV of France, Pope Clement V, but King Dinis of Portugal re-instituted the Templars as the Order of Christ. However, the story of the Templars' persecution has proved a tempting source for many organizations to use to enhance their own dignity, history, and mystery. Another legend originates around Switzerland, and associates the Knights Templar with the founding of the Swiss country. ↑ Picknett and Prince, 1998. ↑ Baigent, et al., p. 44. ↑ Templar History Magazine, Did the Templars form Switzerland. Retrieved August 28, 2007. Baigent, Michael, Richard Leigh, and Henry Lincoln. Holy Blood, Holy Grail. New York: Delacorte Press, 1982. ISBN 9780440036623. Barber, Malcolm. The New Knighthood: A History of the Order of the Temple. Cambridge: Cambridge University Press, 1994. ISBN 0-521-42041-5. Barber, Malcolm. The Knights Templar: Who were they? And why do we care? Retrieved August 28, 2007. Butler, Alan, and Stephen Dafoe. The Warriors and the Bankers: A History of the Knights Templar from 1307 to the Present. Belleville, Ont: Templar Books, 1998. ISBN 0-9683567-2-9. Brighton, Simon. In Search of the Knights Templar: A Guide to the Sites in Britain. London: Orion Publishing Group, 2006. ISBN 0-297-84433-4. Fletcher, Richard. The Cross and the Crescent: Christianity and Islam from Muhammad to the Reformation. London: Allen Lane, 2003. ISBN 9780670032716. Frale, Barbara. "The Chinon chart—Papal absolution to the last Templar, Master Jacques de Molay." Journal of Medieval History 30: 2. Howarth, Stephen. The Knights Templar. New York: Barnes & Noble, 1982. ISBN 9780880296632. Martin, Sean. The Knights Templar: The History & Myths of the Legendary Military Order. New York: Thunder's Mouth Press, 2005. ISBN 1-56025-645-1. Partner, Peter. The Murdered Magicians: The Templars and Their Myth. Oxford: Oxford University Press, 1982. ISBN 9780192158475. Picknett, Lynn, and Clive Prince. The Templar Revelation: Secret Guardians of the True Identity of Christ. New York: Simon & Schuster, 1998. ISBN 9780684848914. Ralls, Karen. The Templars and the Grail. Wheaton, IL: Quest Books/Theosophical Pub. House, 2003. ISBN 0-8356-0807-7. Smart, George. The Knights Templar: Chronology. Bloomington, IN: Authorhouse, 2005. ISBN 1-4184-9889-0. Upton-Ward, J.M. The Rule of the Templars: The French Text of the Rule of the Order of the Knights Templar. Woodbridge, Suffolk, UK: Boydell Press, 1992. ISBN 0-85115-315-1. Knights Templar Catholic Encyclopedia entry. Templar History Magazine Popular history of the Templars. This page was last modified on 20 April 2018, at 16:55.